Not even their own supporters are all that excited about winning. Driving the election is antipathy toward the competition: 80% of Trump supporters and 62% of Clinton supporters say if the other candidate wins in November, they would feel “scared,” the most negative of four possible choices. Those are stronger feelings than they express about a victory by their own candidate. Just 27% of Clinton supporters and 29% of Trump supporters would feel “excited,” the most positive choice. A majority of both sides — 62% for Clinton and 52% for Trump — predict a more temperate “satisfied” feeling instead. Despite such considerable dislike for Clinton and Trump, only 9% support Gary Johnson and 4 % support Jill Stein. However, 76 percent believe they should be included in the presidential debates. Presumably their support would also increase if more voters could actually see them in the debates. 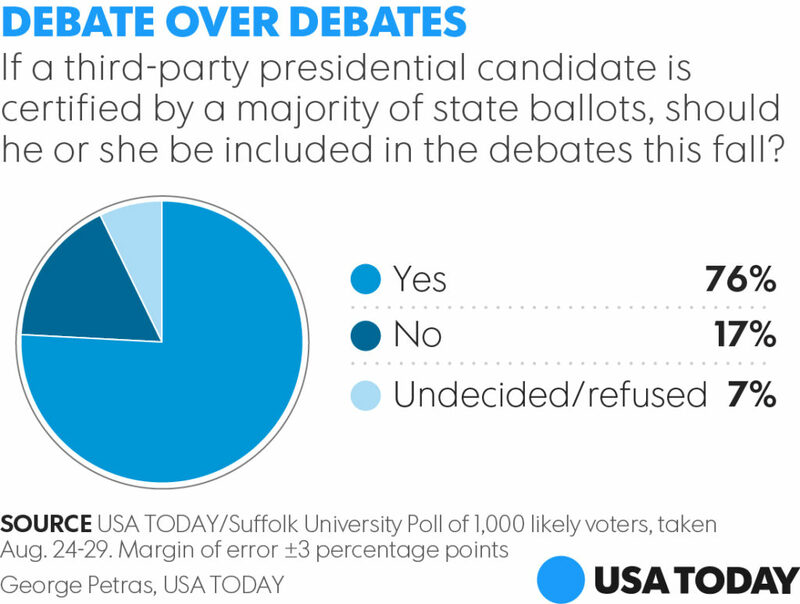 Current rules require that a candidate be at 15 percent in the polls to be included in the debates. USA Today also found that a majority of those voting for Clinton are very likely or somewhat likely to split their vote and vote for Republicans down ticket. This is presumably because they are voting for Clinton out of hatred for Donald Trump and not support for her or her party. Besides, Clinton is far closer to the Republicans ideologically, and it would make sense for those preferring a Republican Congress to back Clinton for president. I also wonder how many see a Republican Congress as a means of keeping check on corruption from Clinton, assuming she is elected. If this result holds, it suggests real disaster for the Democratic Party should Clinton be elected without bringing in Democrats down ticket. Normally the party winning the presidential election does well down ticket in the presidential election, but then suffers losses in the off-year election. If Democrats do not start out with a good year this year, midterm loses could be devastating, especially if Clinton remains as unpopular as she is now. I suspect this is an election in which the party who loses the White House will wind up doing better long term.